1. These vegetables require NO prep work. There are plenty of kitchen hacks out there that will tell you how to peel or dice or slice veggies a little faster, but none of those tips will eliminate the need to do those tasks. The dried vegetables contained in Harmony House Vegan Soup Mixes are already washed, peeled, and chopped or diced. They are ready to be added to recipes right out of the package. For this reason, our soup blends can be particularly helpful to have on hand in the kitchen for people with mobility issues or arthritis. 2. Mixes contain no-soak, fast-cooking dried beans and legumes. Many kinds of dried beans and legumes that you find in the grocery store must be cleaned, sorted, soaked overnight, and then cooked for hours before they are tender. Not Harmony House beans! The beans, lentils, and peas contained in our soup blends are prepared using our own patented process which does all the work for you. The lentils in our Green Lentil Soup with Quinoa are tender and ready to eat in minutes, not hours. 3. These ingredients stay fresh for a long time with little effort. Fresh vegetables last only a few days in the fridge, though there are a few tricks you can use to extend shelf life. Green peppers can last longer if stored in a plastic bag in the fridge, for instance. But no matter what tricks or tips you use, you have a very limited amount of time before veggies dry out or rot. This is not the case with the dried vegetables contained in our Soup Blends. The suggested shelf-life of Harmony House Soups is two years, though they can stay fresh for longer if stored properly. 4. Packing more food in the pantry means making fewer trips to the store. Because our dried soup mixes are so compact, you can pack a ton of food in a small space. For instance, our Southwest Style Mixed Bean Chili contains pinto beans, red beans, dark red kidney beans, white onions, and a mix of red and green bell peppers. A 15 oz. jar of dried mix makes up to 24 cups of chili! Think of all the southwestern style casseroles, cornbreads, and frittatas you could make with just that one small jar of food. That means fewer trips to the store and more nights at home eating dinner with your family. 5. One packet of soup mix can be used in countless recipes. Soup and chili are not the only dishes you can make with our mixes! The veggies and beans in our soup blends can be used to make or enhance tons of recipes. We covered how you can enhance stew, casserole, and chili recipes with dried soup mix in our blog entry Cooking Something Bold: Creative Meals with Dried Soup Mix. For even more easy cooking tips and ideas, read 20 Uses for Dried Vegetable Soup. These are just a few of the reasons why we love having a supply of dried soup on our pantry shelves at home. We offer a variety of soup and chili samplers, variety packs, and pantry stuffer kits so you can experiment in your own kitchen at home. 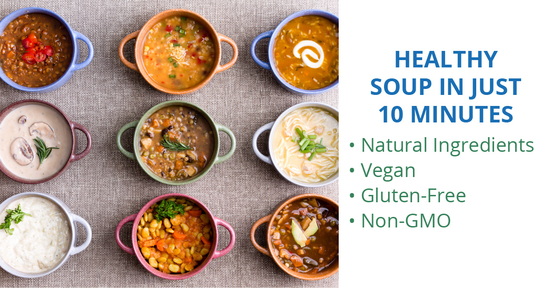 Check out the Harmony House Dried Soup Comparison Chart to see which option is right for you.